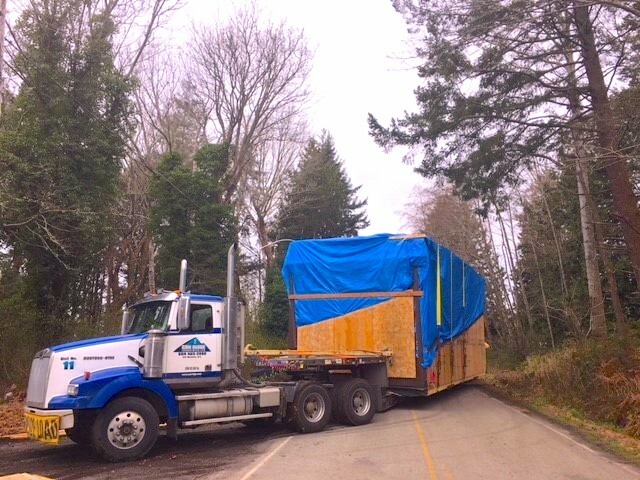 Recently the Can Ridge Logistics and Transport Team orchestrated a large, complicated move across the border from British Columbia to Washington State. Many of our customers have sent us queries on how cross-border moves are executed and how the timeline is affected by the crossing process. 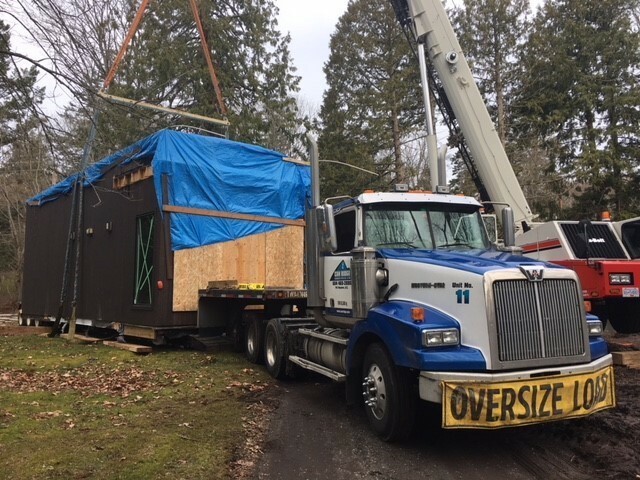 In this article, we will walk you through the exact steps we followed to transport a full modular home from Tsawwassen to Point Roberts. Before we even thought about bringing our machinery out, we had to plan ahead. 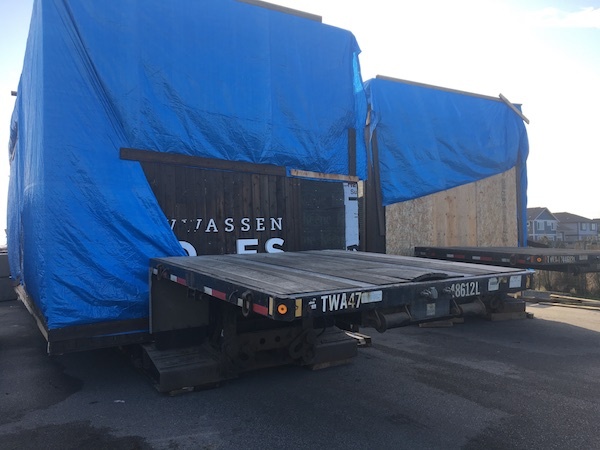 Our representatives travelled to Tsawwassen to appraise the load site, analyzing the surrounding area to see if it was mobile crane and truck accessible. 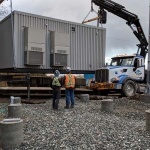 The estimated dimensions we were provided for the modular structures were not accurate and resulted in a change of plans. 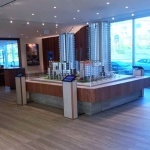 Verifying measurements is critical as it can impact the types of permits required for the move. 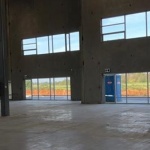 Once we have all of the details, our support team can then acquire all of the required permits for the job, making the entire process simple for our client. 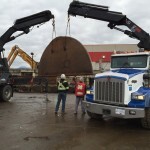 Next step was to analyze the route we would take to move the assets from Tsawwassen to Point Roberts in Washington State. The Can Ridge pilot service travelled the entire route, identifying any low hanging structures and highway anomalies that might affect the transportation service. Our pilot service identified 5 low hanging wires that were definitely a cause for concern. Skipping this step could have had serious consequences. Not only would the obstructions have put the equipment and others on the road at risk, our trucks would not have been able to pass under them. This would have resulted in delays in delivery times. 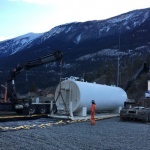 The Can Ridge team finished the preparation stage by orchestrating the lifting of the obstructing wires with the help of a professional electrical contractor. Now that the entire lift site and transportation route had been analyzed, we could now begin the actual moving phase with peace of mind. 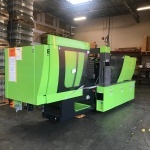 One of our favourite aspects of logistics and working with mobile cranes is the amazing feats we can accomplish with the intelligent use of machinery! It’s pretty exciting when your team is responsible for moving an entire home from one country to the next. The day before the actual move we went to the site and loaded the structures on double drop trailers. 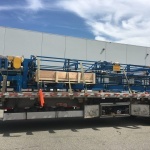 These trailers have a 24-inch deck height off the ground which created an overall payload height of 17’1”. With a load of this size, you require a special “superload” permit which we arranged for our client. 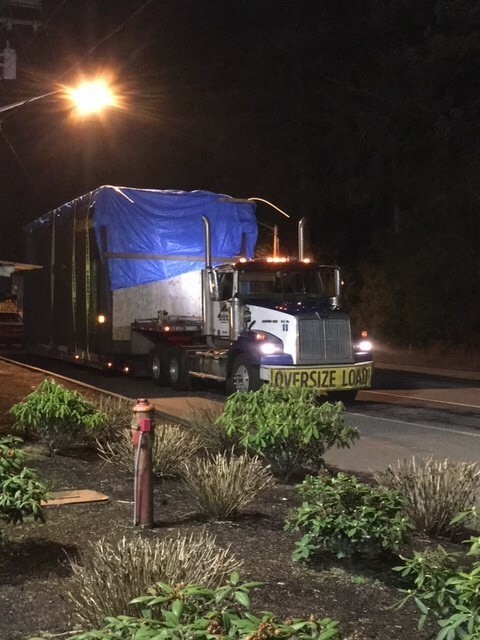 We had to deal with a tight timeline and have our trucks off the Canadian roads by 5 AM, which meant departing the site around 3:15 AM. There were absolutely no complications on-route, guided by our 4 pilots cars (2 in front of each load). The lead Can Ridge pilot car had a special pole that would further measure any low hanging structure as a further precaution. We arrived at the border on time and continued through with no complications. Our team arrived at the off-load site at approximately 6:00AM, just in time to meet up with the crane that was helping with offloading. 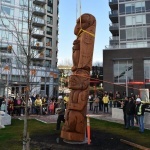 We ensured the crane was positioned in front of the foundation of where the structures were going to be placed. The only complication we ran into here was the very soft terrain. To combat this issue we did a little thinking on the spot and laid lumber and plywood down anywhere the trucks would be driving to avoid getting stuck. It took about 4 hours total to offload the two structures and ensure everything was settled properly on the foundation. Interested in learning more about our capabilities or processes? Perhaps you have a large scale move that requires our expertise and equipment? Give our team a call at any time to receive a free quotation or click the link below!